A yogurt lover's essential, the extra set of eight 6-oz. glass jars allows for making up to eight different types of yogurt at one time. No need to finish the first batch before starting another! For use with our Automatic Yogurt Maker, these 6-oz. glass jars feature a freshness dating system that allows you to note the yogurt's made-on date. For use with our Automatic Yogurt Maker. 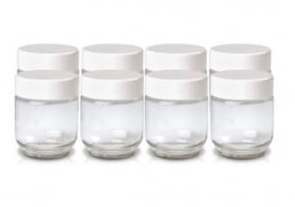 Includes eight reusable glass jars and plastic lids. Each jar holds a 6-oz. serving.